The Professional Regulation Commission (PRC) officially announced that 35 out of 53 hurdled the Psychologist board exam and 1,290 out of 3,283 passed the Psychometrician Licensure Examination given by the Board of Psychology in Manila last October 2014. PRC said that the result of examination with respect to one (1) examinee was withheld pending final determination of his liabilities under the rules and regulations governing licensure examination. 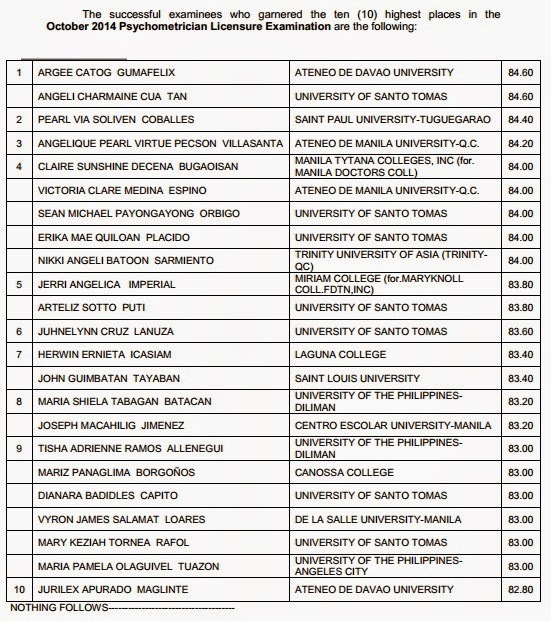 University of Santo Tomas (UST) was named top performing school for having 81.91% passing rate in the Psychometrician board exam as per Commission Resolution No. 2010-547 series of 2010. Meanwhile, Ateneo de Davao University (AdDU) and UST graduates topped the board with 84.60 percent average grade. The members of the Board of Psychology who gave the licensure examinations are Ms. Miriam P. Cue, Chairman; Ms. Alexa P. Abrenica and Ms. Imelda Virginia G. Villar, Members. Registration for the issuance of Professional Identification Card (ID) and Certificate of Registration will be on November 24-26, 2014. Those who will register are required to bring the following: duly accomplished Oath Form or Panunumpa ng Propesyonal, current Community Tax Certificate (cedula), 1 piece passport size picture (colored with white background and complete name tag), 2 sets of metered documentary stamps and 1 short brown envelope with name and profession and to pay the Initial Registration Fee of P600 and Annual Registration Fee of P450 for 2014-2017. Successful examinees should personally register and sign in the Roster of Registered Professionals.